Home > Food News > Alert: No More Instant Noodles! Alert: No More Instant Noodles! There is certainly lots of selection when it comes to instant noodles. With many different brands and flavors on supermarket shelves, this convenience food is known for being cheap and super easy to prepare. Just add boiling water, wait a couple of minutes and you’re done! The popularity of instant noodles has me baffled. They don’t even pretend to be healthy! I visit the grocery store and see so many people checking out the instant noodle options. People will eat them in their cars, at their desks at work or at home because of the sheer convenience of the products without giving much thought to the notion that they are worse than empty calories. We all know what it’s like to have to eat lunch and drive at the same time, or maybe you make a habit out of sleeping in and not having the time to make your lunch at all. Instant noodles seem to be a common quick-fix for hunger. 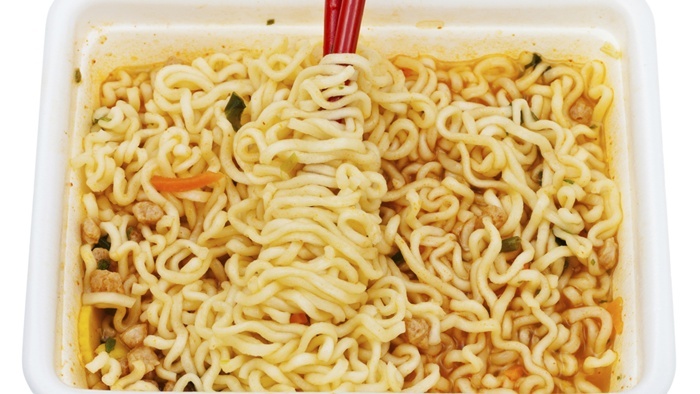 But be careful, a new study indicates the regular consumption of instant noodles can be bad for your heart. The research looked at 11,000 Korean women between the ages of 19 and 64 and showed the higher the consumption of noodles, the higher the possibility of developing metabolic syndrome. People with metabolic syndrome have higher levels of insulin resistance, blood pressure, cholesterol and blood sugar. These people also tend to be obese and have large waist circumferences—all bad news. The results of this study revealed that women who ate the instant noodles at least twice per week had a greater risk of developing metabolic syndrome compared to the women who ate very little or none. This result was also evident in women who were slimmer and more physically active, so the findings weren’t limited to women who had weight problems or issues with obesity. This study was conducted in South Korea where approximately 3.4 billion packages of instant noodles were consumed in 2010 alone. According to study author Hyun Shin from the Harvard School of Public Health, “Although instant noodle is a convenient and delicious food, there could be an increased risk for metabolic syndrome given the high sodium, unhealthy saturated fat and glycemic loads.” You think? This information is only partially correct in my opinion. The reason these noodle dishes can produce metabolic disturbances consistent with metabolic syndrome is because this food is made mainly with processed white flour products. The high glycemic load increases blood sugar and keeps it elevated. The high glycemic load can produce high levels of insulin to combat the high blood sugar. After some time, the insulin secreted can no longer effectively lower the blood sugar because the cells are not capable of recognizing it. This is insulin resistance, the basis of metabolic syndrome. Here in North America, although not as many packages of instant noodles are sold, larger numbers of people are regularly consuming them given their low price and convenience. My recommendation is to only eat them occasionally. If you must have them, decrease the portion size by adding them to a meal of vegetables and lean chicken cubes. But of course, the best advice I can give you is to ditch them completely. Shin, H., et al., “Instant Noodle Intake and Dietary Patterns Are Associated with Distinct Cardiometabolic Risk Factors in Korea,” Journal of Nutrition, 2014; 144 (8): 1247 doi: 10.3945/jn.113.188441.